We’ve had temperatures as low as 22°F and snow flurries in late October and December. So how’s my $13.67 greenhouseperhaps doing? My experiment in frugality has lasted longer than I imagined because of our extra-warm fall and early winter. Yes, we’ve had a few flurries and quite a few nights with sub-freezing temperatures. The warm weather caused my September lettuce plantings to grow rapidly. I harvested that planting and then moved the greenhouseperhaps to a more protected location and planted a second crop of three Red Sails lettuce plants that I had started in yoghurt cups inside our house. So how are the three lettuce plants doing? Fine, thank you. 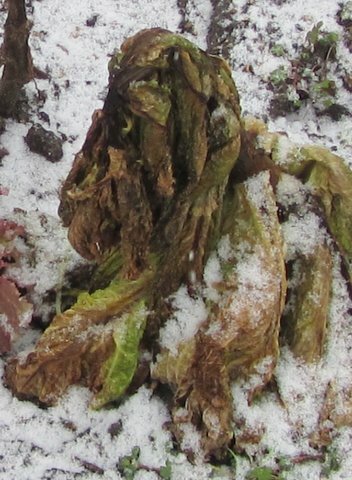 When I unlatched the two click handles today and lifted the top off the box, a sheet of thin ice slipped off the top and shattered on the garden soil. 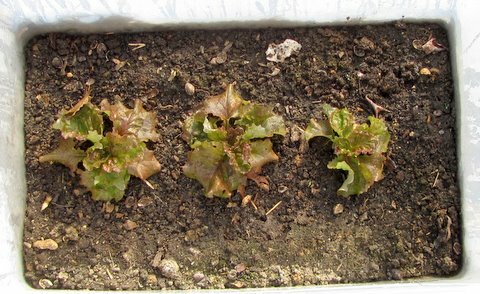 Inside the box, the three Red Sails lettuce plants are growing slowly and showing no signs of freeze damage. Outside the box just 40 feet away two Simpsons Curled lettuce plants stand as slushy evidence of what sub-freezing temperatures can do to lettuce. Why has my greenhouseperhaps worked so far? I think there are several reasons. First, Red Sails lettuce seems slightly more cold-hardy than other lettuces, such as the Simpsons Curled. Second, I’ve positioned the box about three feet from the south side of a brick wall, where it will benefit from winter sun and have some protection from cold north winds. Third, the plastic container creates a slightly warmer microclimate for the three plants. The soil there is dark brown because I’ve added plenty of compost over the years, so the dark soil absorbs warmth from the sun’s radiation. The lidded box itself helps keep heat in and cold out and helps protect the plants from chilling winter breezes. 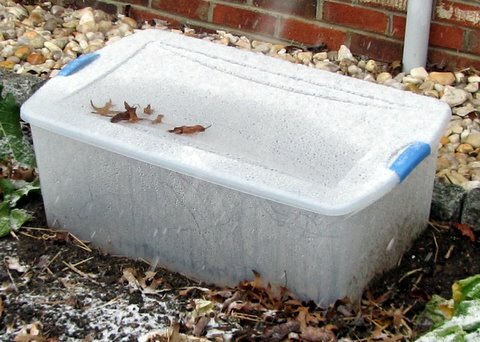 Even though a sheet of ice slid off the top of the lid this morning, the inside of the lid and the walls of the box were covered with drops of condensation. How long will the greenhouseperhaps keep the Red Sails lettuce from freezing? I’m a realist. I have no illusion that the lettuce will grow until spring. At some point, an Arctic blast will burn the leaf edges and then turn the Red Sails into green mush. That could be tomorrow night, when the local forecast calls for a low of 19°F. I’ll keep you informed. What has my experiment taught me? Creating a microclimate that lets cool-weather plants grow longer through the fall and into early winter doesn’t have to be expensive or complex. A $13.64 plastic box in a semi-protected location works quite nicely, thank you. The box works on the same temperature-moderating principle as do cold frames and row covers. I think I’ll try my mini-greenhouse again as spring approaches—perhaps as soon as there are hints in February that spring is getting ready to, well, spring. I’ll start two or three lettuce plants—perhaps Red Sail or an even shorter variety—inside our warm house and transplant them when they’re about two weeks young. Perhaps the mini-greenhouse idea is somewhat less than “great,” but it works. Shouldn’t you try it next spring or fall? If you want to read details of how I created the mini-greenhouse, CLICK HERE. Good luck with tonight's weather. If you want an extra layer of protection, throw a old quilt, large piece of old carpet or doubled up tarp over the box. It will add a significant amount of extra insulation and extend the life of your lettuce. Also, if you would like to really experiment next year, we could built a hot bed, cloch or a row tunnel with 6 mil clear plastic. See the original Crockett's Victory Garden pages 28-29.